We go hands-on with the new Sony Alpha A9, Sony's high speed, professional full-frame mirrorless camera. 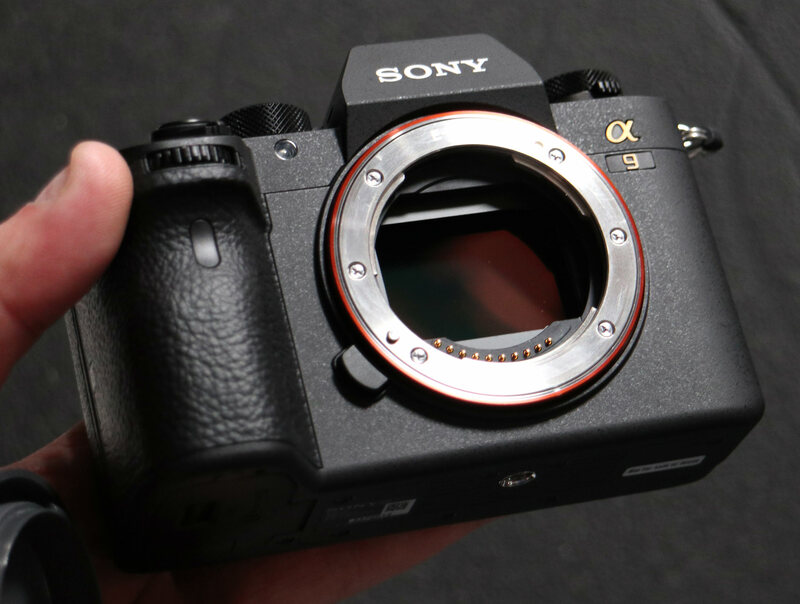 Sony has announced the new Sony Alpha A9, a professional, high-speed mirrorless camera, with a 24mp Full-Frame stacked BSI CMOS sensor, for high speed shooting at 20fps, as well as a new battery for longer battery life. The camera will be available from June, with an RRP of £4500 body only. We've been shooting with the A9, and were impressed by the bold claims of 20fps continuous shooting, without blackout, and can confirm that this is actually possible! Check out this video from 'Three Blind Men and An Elephant Productions' which shows there really is no blackout when using this camera. Focus is rapid and covers an impressive 93% of the frame. The camera has a large buffer, being able to take 241 RAW (compressed) images, and up to 362 JPEG images without slowing down, with full-time AF / AE tracking. There are dual SD card slots, with one of these supporting UHS-II memory cards. There's also a built-in LAN connection, which professional sports photographers will want. The menus have been updated, and there is a "MyMenu" section, where you can add up to 30 of your favourite settings. There's also a joystick on the back for quicker operation. The mechanical shutter is rated for 500,000 shots, although it will probably be difficult to reach this number, as the camera uses the electronic shutter when shooting at 20fps. The camera weighs 673g with battery and memory card included. The camera uses a new Sony Info-Lithium Z (NP-FZ100, 2280mAh) battery that gives up to 650 shots when using the LCD, or 450 when using the EVF. There is an optional battery grip introduced, that holds two batteries, as well as another power accessory that holds 4 batteries, for extended shooting. If the AF is fast and accurate, and the high ISO noise is as low as the A7Sii/A7Rii, this will be the perfect photographers tool. I'll trade in my bodies in a heartbeat if the reality is as good as the promise. If the AF is fast and accurate, and the high ISO noise is as low as the A7Sii/A7Rii, this will be the perfect photographers tool. I'll trade in my bodies in a heartbeat if the reality is as good as the promise. Exciting times for camera innovation. Sony and Fuji both pushing the envelope. If Sony can come up with the glass at the long end for the pro's, then things will get very interesting. Time for Canon and Nikon to get their finger out. Exciting times for camera innovation. Sony and Fuji both pushing the envelope. If Sony can come up with the glass at the long end for the pro's, then things will get very interesting. Time for Canon and Nikon to get their finger out. Sony listen to their customers and address their needs in the A9. I understand at the event over 4,000 shots on one battery was normal. Two cards, touch screen, better placed video button, 4K video full frame with minimal rolling shutter, every thing the customers asked for. For sports and wildlife flight shots not having black out is sensational. Several who have tried it say it is dreadful to return to a mirrored camera one you have used the A9 I have pre-ordered the A9. Not suppressing as I changed from Nikon to Sony 10 years ago. But more astounding is My two wildlife photographer friends who shot Canon have also pre-ordered it. one selling his Canon 1D4 and 500mm F4 lens. Most of my high end Canon friends who shoot wildlife, use a 100-400 lens, and Sony have introduced the GMaster I use the 70-200 GMaster with a 1.4 and a 2X converter, which give me 400mm Sony will bring out E-Mount 500mm and 400mm prime before too long, for the pros. few amateurs will spent that kind of cash. Sony listen to their customers and address their needs in the A9. I understand at the event over 4,000 shots on one battery was normal. Two cards, touch screen, better placed video button, 4K video full frame with minimal rolling shutter, every thing the customers asked for. I have pre-ordered the A9. Not suppressing as I changed from Nikon to Sony 10 years ago. But more astounding is My two wildlife photographer friends who shot Canon have also pre-ordered it. one selling his Canon 1D4 and 500mm F4 lens. Sony will bring out E-Mount 500mm and 400mm prime before too long, for the pros. few amateurs will spent that kind of cash.